As they do every four years, the Olympic Games have brought public attention to the sport of fencing. The public then quickly realizes that no one other than fencers really cares about (or is able to understand) Olympic fencing and moves on to more mediagenic sports such as dressage which, even if it is at least as incomprehensible as fencing to non-initiates, at least has pretty horses. Nonetheless, this Olympiad has been a windfall to arms and armor enthusiasts and scholars alike, as British arms and armor museums have taken the opportunity of the London games to publish several intriguing book projects this year. The projects have included a reissue of Jeffrey Forgeng’s translation of the oldest European fencing treatise, Royal Armouries I.33, and Wallace Collection curator, Hampshire College alumnus, and jouster extraordinaire Tobias Capwell’s Masterpieces of European Arms and Armour in the Wallace Collection. Capwell’s other book for the year, The Queen of Weapons, is a more modest overview of that Renaissance gentleman’s constant companion,released as a free eBook. 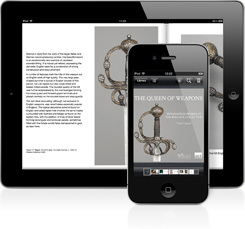 Though it is not really appropriate to conduct a full academic critique of a popular-audience work such as the Queen of Weapons, I am happy to report that Capwell gives a good generalist overview of the development, use, and sociocultural context of civilian weapons in the late Middle Ages and early modern era. Capwell begins his effort with the sword in the Middle Ages, noting the sophistication of medieval martial arts and the level of craft that went into the creation of the weapons. He then traces the development of the rapier, a civilian thrusting weapon that was both a quotidian fashion accessory and a practical tool of self-defense, and gives background information such as the late sixteenth-century controversy over the ideal length of a weapon. In all, twenty weapons are displayed in dazzling photographs, including less-often considered weapons such as the estoc and cinquedea, alongside paintings and plates from Renaissance fencing treatises such as those of Marozzo, Sainct-Didier, Silver, and Capo Ferro. As befitting a work highlighting a museum collection, Capwell lavishes much attention on the art-historical appreciation of these noteworthy pieces from the Wallace. Highly ornamented hilts are well displayed with meticulous photography, with special attention played to sixteenth- and seventeenth-century Italian cutlers’ high development of techniques of chiseling and damasking. Capwell also points out that the English were no slouches so far as craftsmanship and ornamentation of weapons went, and his concern for this mirrors his scholarly interest in uniquely English styles of armor. The last portion of the book shows highlights from the general Wallace collection, including snuffboxes and wine coolers. There is one major problem with this work, for which I cannot blame the author: The digital format is awkward. Though the book was well worth the price, the e-reader cost $7 from the Apple app store. Even so, none of the images displayed properly on my MacBook, and were too small to see properly on my iPhone. From what I could make out, the art is gorgeous. Presumably, the effect would be better on a iPad, as was intended. After all, we live in an age where product placement is all—both at the Olympics and, it seems, in museum publications. Though Dr. Capwell seems to not have studied his Agrippa—an insult I will obviously have to address in person once my 15th century harness is finished and I can figure out a way to get a large horse across the Atlantic. This entry was posted in BookReview and tagged arms&armour. Bookmark the permalink.